Double click the videos to go full screen! 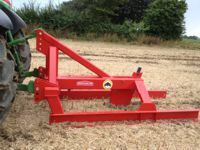 Quivogne UK have developed a completely new single leg double beam mole plough. 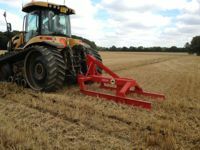 This has been in conjunction with Michael Moore, drawing on his 30+ years involvement with mole plough design and usage. The MM Mole features traditional double beams for level moleing as well as added stability. The location of the mole leg differs from other existing machines. 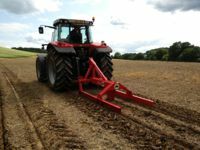 We have brought the mole leg forward, closer to the tractor, thus reducing the distance from the front of the tractor and the mole leg by up to 2m, whilst still maintaining the levelling function of the two beams. The logic behind this move is a combination of factors including taking into account the sheer size and importantly length of modern tractors as well as the fact that historically the last drain of the field is 15m away from the hedge or ditch. With the leg being brought forward in this way, the user is able to get further over the existing old drains and raise the machine directly out rather than planing out of the ground. 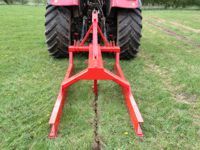 The spacing between the beams has been designed to fit inside that of the tractor tyre wheelings, therefore enabling an undisturbed and constant depth if the tyres bite or sink into the ground. 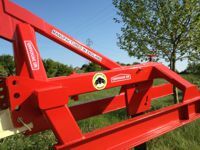 Being mounted, the MM Mole if far more manoeuvrable than trailed versions and also enables the user to lower or overhang the leg directly into ditches ready for work. One of the main features of the MM Mole is its superb ability to cope with excess trash, chopped and wet straw due to its impressive 400mm (16 inch) under beam clearance. This under beam clearance prevents debris from wrapping around the leg and eventually raising the machine. The working depth of the leg is fully adjustable from 460mm (18 inch) to 660mm (26 inch)and also features an easy to use pitch adjuster. An option of a leading disc coulter assembly is also offered if required. From 150hp upwards depending on moling depth and soil conditions. Now available the MM Mole Twin leg! Using the same design elements and principles as the hugely successful single leg mole, the new Twin leg version has been developed for the larger horsepower market. The twin leg machine features individually pivoting tine assemblies meaning that when in work they pull in a straight line, but if one leg was to glance the side of a rock, it can pivot left or right slightly whilst not effecting the work. 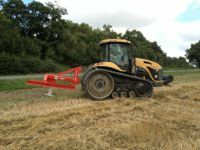 At the same time, this feature eliminates any sideways stress on the machine itself or the linkage to the tractor. The twin leg MM Mole also features the ability to be transformed into a single leg machine if required. 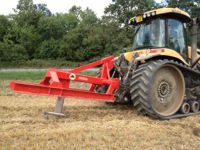 For example if the large horsepower primary cultivation tractor is needed elsewhere, simply remove the two connection pins on one of the tine assemblies, and move the entire assembly into the centre of the machine. Remove the leg from the other tine assembly and you have quickly transformed the twin leg into a single leg mole for a smaller horsepower tractor to use.